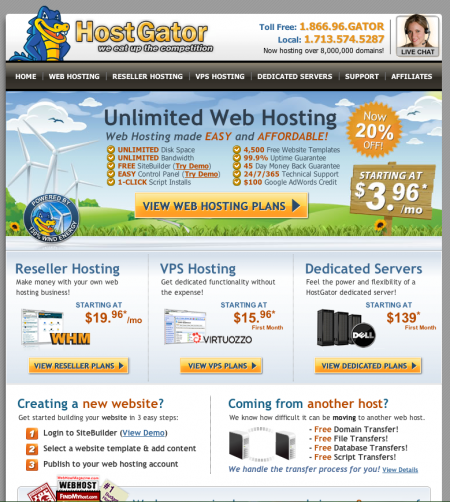 HostGator has a highly flexible Linux VPS program. With nine different service levels, you can build a custom VPS based on your business needs. The first two service levels are not fully managed, so we've only included fully managed hosting plans here. Fully managed plans take the guesswork out of it for you as a consumer, where as semi-managed plans require you to handle your own technical settings. If your business requires Windows based hosting, you will not be able to use HostGator. We recommend you use MyHosting.com for your Windows VPS free trial. HostGator's VPS plans all come with a 45 day money back guarantee, so you can try their system for free. If you are not happy with the purchase, you can submit a refund request. Each plan comes with your choice of cPanel or Plesk for management and includes 2 dedicated IP addresses. You will also get to host unlimited domains, subdomains, email accounts, and FTP accounts. You will get weekly backups of your data, with full root access. Plesk may be available for free for the first year, or billed at an additional $5/month depending on promotions at the time of sign-up. You may upgrade to four dedicated IP addresses for additional monthly fees. You can use an existing domain, or purchase domains for $15/each. Copyright 2011-2014. VPS Free Trials.